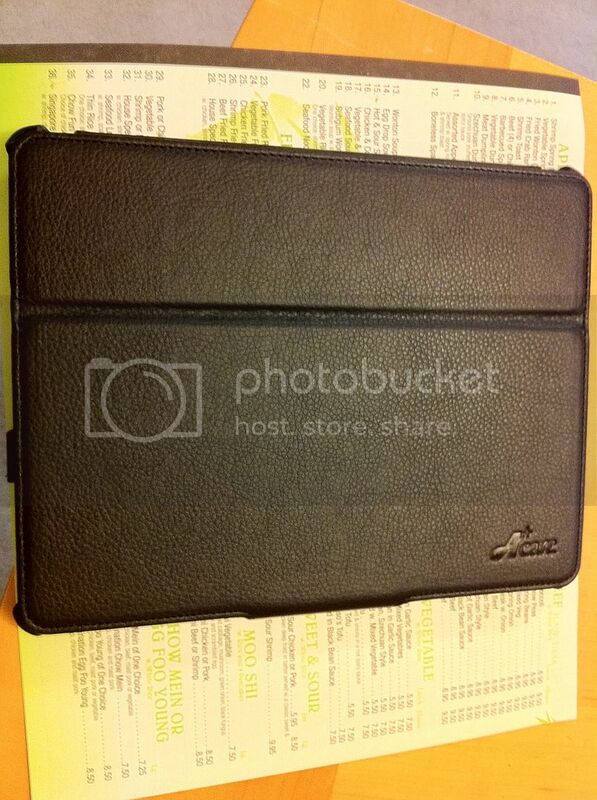 Discussion in 'iPad Accessories' started by ForumViewer, Apr 17, 2011. Came across this folio case on Amazon and while the reviews seem to be few and far between, it looks like a decent folio case and for $23 and some change, it's a pretty reasonable price. Coupon code is 4BA889A2 (and no, I am not the seller, just a regular customer). I ordered one myself and can post a quick review once it's received if requested. 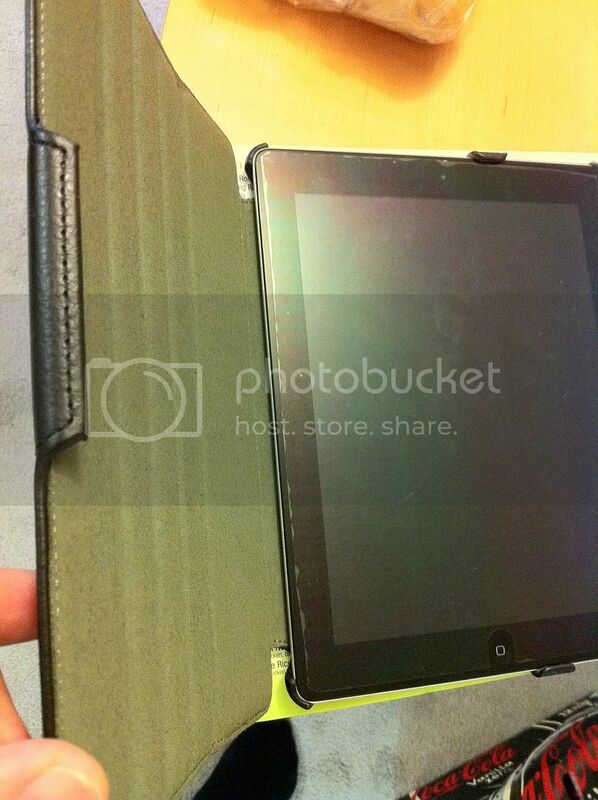 Looks like the Toblino 2, I actually prefer the leather from this case and the additional viewing angles. Sadly the case doesn't feature any use of magnets. Other than that, looks like a great case. I'm considering getting one myself. I clicked on your link and the price was $32.95, not $23 and some change. Looks like you have to enter the discount code to get 30% off. Correct, enter it at checkout. 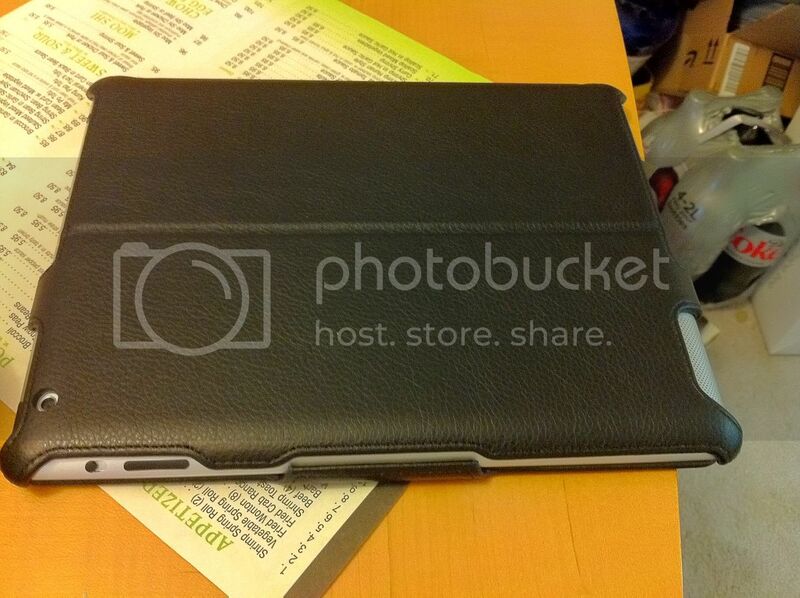 I've been looking for one similar to iPad 1 casing but so far... no luck. There's a great video review on the amazon site. Although it's flash and won't play on the iPad but it's a good video if you can play flash. Just ordered 1! I hope it's "premium"! Got my case 1 day shipped from amazon. Let me just say - this is one HELL of a professional case. LOVE the material used on it. It's like a basketball. Don't think it's real leather, but I love it either way. It fits like a glove. NO wiggle, absolutely perfect fitting. Not too heavy. Feels really great in the hand. I'm not gonna go through the posistions etc...because you all know how it works. If I had to say one thing about this stand - is that it's professional and extremely form fitting with great material. I was thinking about this case before I bought toblico case. Is it hard to unsnap the tabs to stand position? 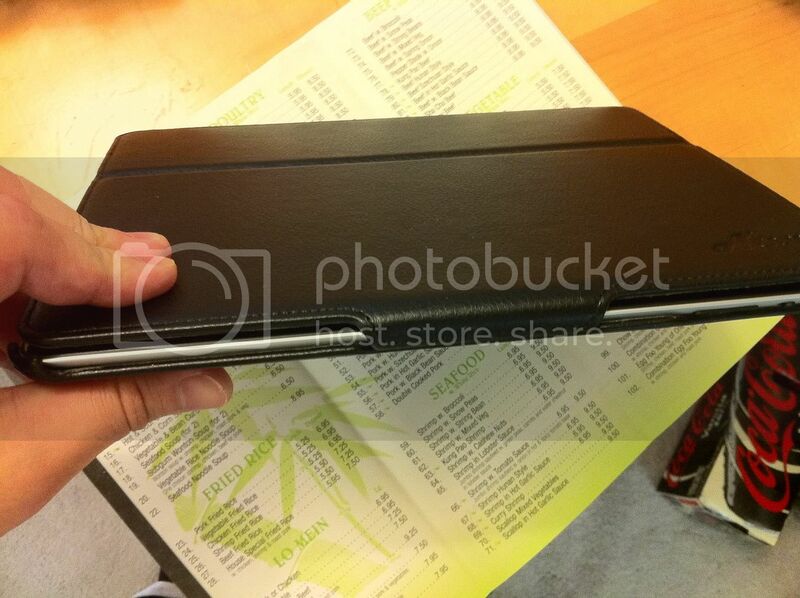 It's hard to unsnap the cover, but not the tabs to get it to stand up on the creases. Hi. Is it stable when you prop up the ipad on the last indent? How about pulling it out all the way out against the clasp? It is not stable when you put it to the first indent because there's a stupid crease on the back, but every other indent is perfect. Its one hell of a case for a hell of a price. I've had a while to use this case now so I'd rate it 7 out of 10. At $23, it's hard to complain given how much other cases and covers typically cost. The main reason I chose a folio-style case is because I wanted one that would hold the iPad in a very stable position on my lap or in bed. This case does that very well. The grooves for the different angles have worked out quite nicely. My biggest gripe is that the two corners closest to the crease that are supposed to hold the iPad in place (and allow it to slide out to different positions) do not hold it well enough when you hold it in portrait view. They basically do nothing. See the pic. 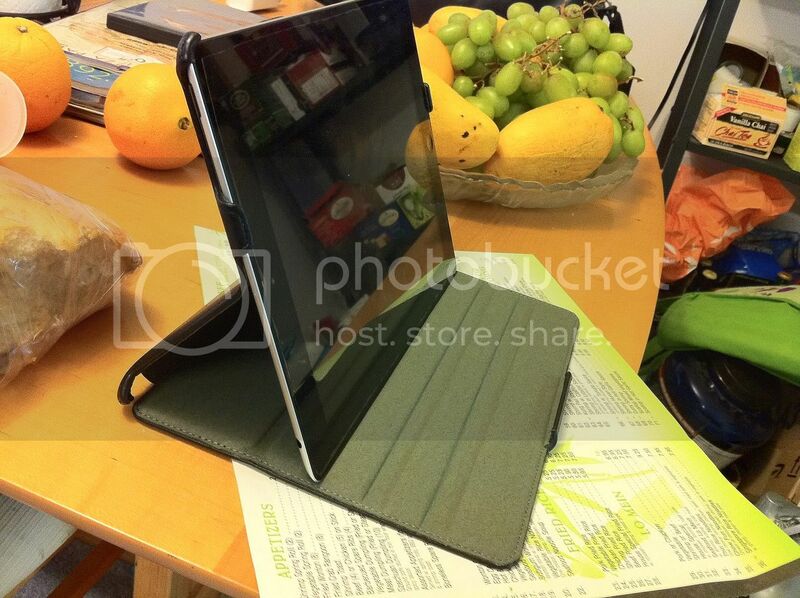 As you can see, those two corners do not hold the iPad at all, no matter how hard a squeeze it in. Maybe I have a defective case? I don't know, but this is the one I've got and to me it's pretty annoying. Now granted, I rarely let the top cover dangle like that, I'm just trying to show how ineffective those two corners are at holding the iPad. Obviously, the top cover would be folded all the way back and pressed against the rear of the iPad under typical Portrait-mode use. 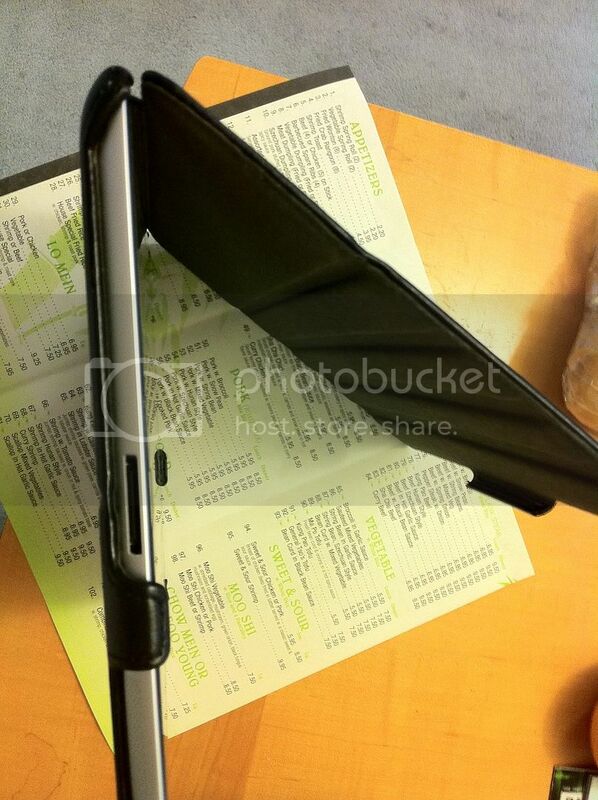 But even then, it's quite noticeable that those two corners are not securing the ipad. 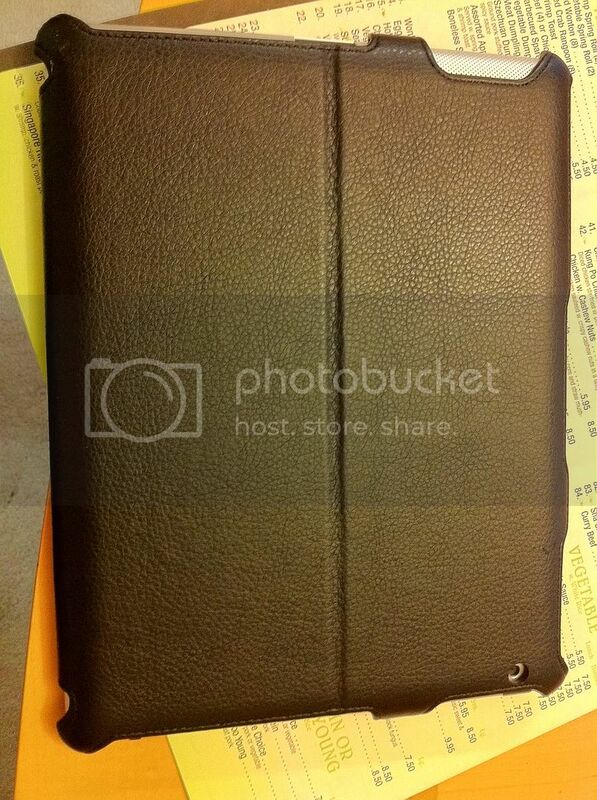 It should be noted that despite those two corners, the iPad is not going anywhere. The other two corners and the two additional "notches" hold the device quite securely - it's in NO danger of falling out. Again, it's a $23 case - so I'm not complaining (too much) and it's not worth it for me to return at this point. This will be my third case now (after finally deciding to get a foilio-style) and I'm basically tired of searching for alternatives at this point. This accesory market still needs to mature. So once more cases hit the streets and become more competitive in both quality and pricing, I will be replacing this one. In the mean, it serves its purpose. Coupon code is not working, anyone else having this problem? Looks like they changed the price to $29.95.